The traditional (and still prevalent) way to teach organic chemistry is to focus on examples that are primarily of interest to students who are planning to become professional organic chemists - that is, to focus on the molecules and reactions of organic synthesis, considering mainly non-aqueous conditions and non-biological reagents. The majority of students studying organic chemistry, however, are doing so because they are majoring in biology, biochemistry, or health sciences. They need to learn about the structure and reactivity of organic compounds because, quite simply, organic chemistry is the chemistry of life. What is most interesting and relevant to these students is the organic chemistry that takes place in the context of a living cell. In this online textbook, a unique approach is taken to the study of organic chemistry. To the greatest extent possible, biological molecules and biochemical reactions are used to explain and illustrate the central concepts of organic chemistry. 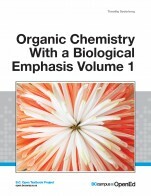 This novel approach is most evident in chapters 9-17, which cover the main organic reaction mechanisms in a biological context. However, earlier chapters on organic structure and spectroscopy also focus as much as possible on examples of interest to students of biology and the health sciences. The chemistry of lab synthesis is not ignored - however, these examples are generally grouped together in subsections and introduced to illustrate parallels between laboratory and biological chemistry. This is a dynamic textbook, meaning that it will be continuously undergoing revision in response to reader input. You just viewed Organic Chemistry with a Biological.... Please take a moment to rate this material. If you know the author of Organic Chemistry with a Biological Emphasis, please help us out by filling out the form below and clicking Send.